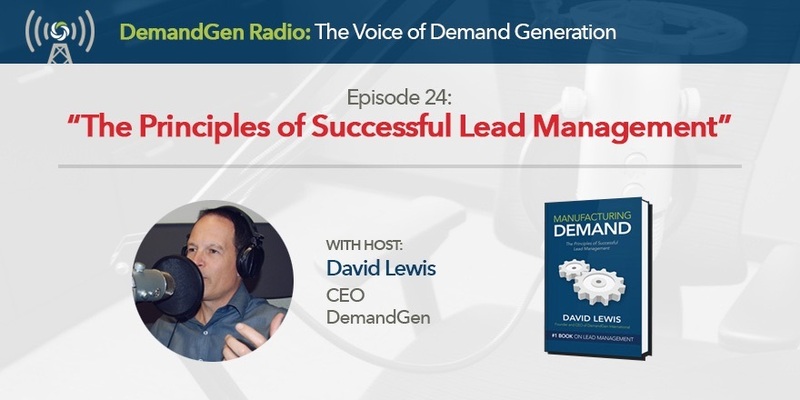 In this episode, I share the key principles of successful lead management from my book Manufacturing Demand which now has over 10,000 copies in circulation. When I wrote the book, my publisher told me an industry factoid that only 1 in 10 people who buy a book actually read it. At first, I couldn’t believe the ratio, but then I looked at my own bookshelf and saw several great books that I planned to read when I purchased them still sitting there collecting dust. As marketers, we know there are 4 types of learners: visual, auditory, reading/writing, and kinesthetic. So for those of you auditory learners, I am going to devote a few episodes of DemandGen Radio to the essential chapters of the book to offer you a “book reading” of sorts. While I won’t read the chapters word for word like you’d hear on audible.com, I will share the main points from each chapter starting with Chapter 2 that outlines the 5 key principles of successful lead management. Listen in at your desk, in your car, or someplace where you can take in the concepts that have been used by some of the top marketing and sales teams around the world.